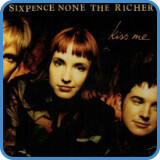 ‘Kiss Me’ is a single from one hit wonder 90s band, Sixpence None The Richer. Using only one chord for the verse, changing in extensions, paired with a repetitive rhythm, ‘Kiss Me’ builds great tension to release its sugar sweet chorus. 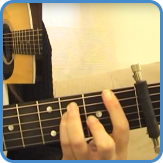 As a capo is used in this song to get the correct chord shapes what you hear is in the key of Eb, although you want to think of this chord progression as if it is in the key of C.
You get a full chord progression analysis, complete with TAB of everything that happens in the video lesson when you take the intermediate course. The intro/verse/instrumental and outro sections mainly stay on a C but change extensions. The chorus takes off harmonically by starting on chord II, then predictably moving to V – I – VI. 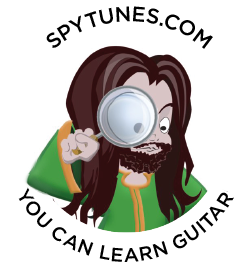 The strumming pattern is extremely repetitive, apart from in the very first bar. 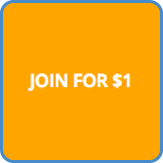 Pair this with the open position C chords on a loop and what you get is a meditative guitar part. It doesn’t actually change at all until the chorus. Here it is broken up, having fewer strums over beat one. This, paired with the chords finally going somewhere, creates a release that sets off the chorus. 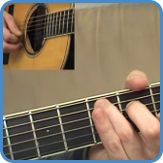 Find out more about how chord progressions can be manipulated like this using small (but effective) changes to the strumming patterns in the intermediate guitar course. For complete lyrics, go to Kiss Me lyrics.